After a degree in economics at the University of Louvain in Belgium, Carlo Thelen joined the Chamber of Commerce in 1996 as economic adviser. He is in charge of strategic papers, studies, surveys and statistics, research and innovation, economical documentation and literature and gives advice and information on these subjects. 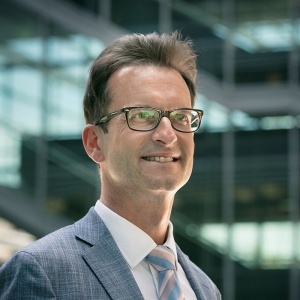 Carlo Thelen is the author of several articles and strategic papers of the Chamber and makes presentations regularly about the economy of Luxembourg to various audiences. He represents the Chamber of Commerce in different working groups and councils of Luxembourg ministries, administrations and other organizations. Since the 1st of August 2003, Carlo Thelen is a member of the Managing Board of the Chamber of Commerce. Since the 1st of January 2004, he is head of the International Affairs and since the 1st of January 2007, he is also the Chief Economist of the Chamber. On the 10th of January 2014 he was nominated as Director General of the Chamber of Commerce.